“Higher Ground” is one of my favorite hymns — mostly because of the tempo and ease of three chords. History of Higher Ground can be found at Bible Study Charts. It’s interesting to note “Count Your Blessings” was written by the same person. You can purchase the ukulele tabs for Higher Ground as part of Ken Middleton’s ebook, 12 Hymn Tunes for Ukulele. Practicing the three chords F, Bb, C7 becomes a joy with this song. It doesn’t seem like practicing at all. This is a great song for either strumming or finger-picking. Finger-picking takes a bit more practice but I prefer it with the hymns. However, if you are performing this song and get nervous with crowds, finger-picking is harder to keep steady. You can hear the difference it makes to finger-pick your ukulele vs. strumming in this sample. 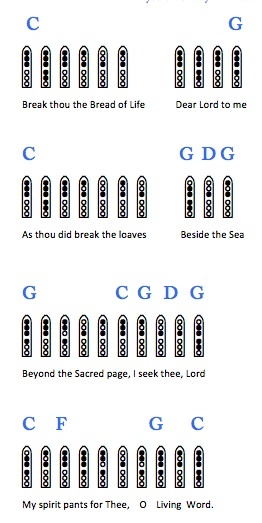 I am using a low g string on a soprano ukulele, but the hymn sounds good on high G or low g. Download a pdf of Higher-Ground that contains ukulele chords and Native American flute fingerings. If you want to change the 3 chords that you use, then you can go to Chordie. Look on the right side of the page and you can change the key of the song by raising or lowering by your desired number of semitones. You can select which ukulele tuning you will use – C, D, or baritone. The chords are shown to you on Chordie or you can download a pdf of ukulele chords to print out. Ken Middleton has a ebook of hymns for ukulele if you’re interested. A version of this hymn in C.
Nearer, my God, to Thee, near er to Thee. Ukulele Perspective has a pdf version of Kumbaya for ukulele and Am Wood flute. A transcript of Kumbaya from 1926. 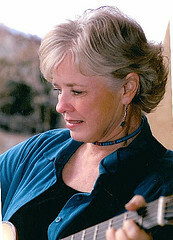 Over on the flute-perspective blog there is a pdf of ukulele chords to go along with NA flute. You can hear a version of the uke and wood flute there too. Nice rendition of “I’d Rather Have Jesus”. Thanks, Leroy. Godly Guitar Tabs: This is a great resource to see lyrics, guitar chords, and hear the song played by fingerpicking style guitar. Thanks, Dan.